Elbow dislocation occurs when the lower end of arm bone (humerus) and upper end of forearm bones (radius & ulna) are separated. 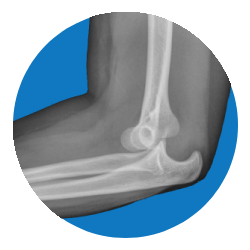 Elbow dislocation can be partial (subluxation) or complete. Elbow dislocation is also associated with fractures, ligament injuries and damage to blood vessels & nerves. When associated with fractures, ligament, Vasscular & Nerve injuries.